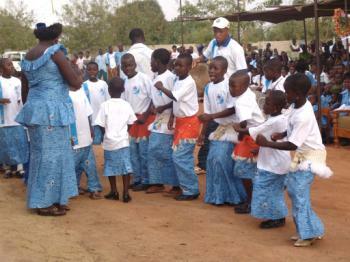 SOS Children's Villages has been working in Togo since the 1970s and in the northern city of Dapaong since 2007. Although the government has taken measures to protect children, many of their basic rights remain unfulfilled in Togo. The city of Dapaong lies in the north of the country, near the border with Burkina Faso and Ghana. Most of the population lives off farming and animal husbandry, mainly for subsistence, but coffee, cocoa and cotton are also produced for export. The area has an important artisan culture, craft products are sold abroad and to tourists who visit the region. The Savanes province is one of the poorest in the country, more than 65 per cent of the population lives below the nationally-established poverty line. 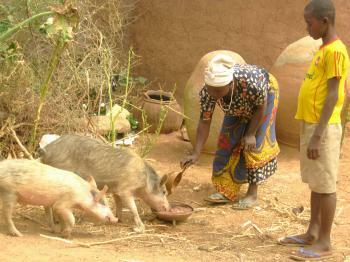 Many people, especially young men, have emigrated to other parts of Togo or abroad in search of work. The high and increasing incidence of HIV/AIDS means that children often lose parental care due to the disease, or have to take responsibility and earn an income at an early age due to their carers' inability to work. The absence of a steady source of income means that families cannot meet the needs of their children, and many children end up losing parental care. Safe drinking water is not easily available, which means that women have to spend a lot of time collecting water from distant sources. This laborious daily activity means that they have less time to look after children or to be involved in money-making enterprises. Due to Togo's proximity to other countries, girls and young women are often trafficked abroad and many end up working as prostitutes. SOS Children's Villages started working in Togo after a study concluded that the organisation's child-care model would meet the specific needs of children without parental care in the country. Since then, our work has expanded and become a holistic package of services which meets the needs of the local population. For example, in light of the low education rate in the country, we run a kindergarten for young children and provide primary school education for older ones. The access to medical care remains uneven and the SOS Medical Centre plays an important role in keeping the local population healthy. SOS Children's Villages works closely with the families in the neighbourhood: it aims to support these families so that they can stay together. The SOS Family Strengthening Programme acts in collaboration with local agencies to ensure that children have access to education and essential health and nutritional services. Families may receive food and medicines or their children might be given scholarships so that they can attend school. We also provide counselling on parenting skills and income generating activities. We strengthen the support systems in the community so that families have someone to turn to when they need help. The SOS Medical Centre opened in 2007 and provides over 12,000 patients a year with treatment. Children who have lost parental care can find a loving home in one of the twelve SOS families, where up to 120 children can be looked after by the SOS mothers. The children grow up in a familial environment full of love, respect and security. Young children can attend the SOS Kindergarten, which has capacity to care for up to 50 children, some of whom come from the neighbouring community. The provision of day-care is particularly valued by those parents who receive training or go to work. Older children go to the SOS Hermann Gmeiner School, where up to 210 pupils can receive a primary education.